Photo Caption: Ashley Holzer and Pop Art Win $25,000 WIHS Invitational Dressage Championship. Photo Credit: Diana De Rosa. This photo may only be used in relation to this PMG press release. Washington, D.C. – October 27, 2006 – Ashley Holzer of New York, New York, aboard Pop Art wowed the crowd and the judges with their Grand Prix Freestyle tonight at the Verizon Center in Washington, D.C. to win the class with a score of 72.565%, which when added to her second place score last night of 67.813% in the Grand Prix, gave her a total overall mark of 70.189% and victory in the $25,000 Washington International Horse Show Invitational Dressage Championship. As winner of the event, Holzer takes home $10,000 in prize money. Holzer, 43, a Toronto native who has represented Canada at two Olympic Games, two World Equestrian Games, and two Pan American Games, came into this competition as the defending champion, having won it last year with the 11-year-old Dutch Warmblood stallion Gambol. Pop Art is a nine-year-old Dutch Warmblood gelding owned by Holzer and Ian Nicoll, her father, who made his Grand Prix debut at this championship event. Mr. Nicoll attended the show and watched his horse win the Invitational Championship. Tonight, Holzer rode a freestyle to Irish-inspired music track created by Karen Robinson of Applause Dressage, based on music from the theatrical show Riverdance. Though Pop Art started his test showing some tension, he relaxed as he performed the movements, especially his precision piaffe and passage, which he nailed dead on to the music. Holzer included movements that elicited applause from the crowd several times, such as a machine-like piaffe that burst into an energetic extended trot. The freestyle also showed how creative and clever Holzer is as a rider. As this was Pop Art’s first Grand Prix Freestyle, Holzer acknowledged that she had to "wing it" during some of the ride. "I did a little adlibbing in there because he was very nervous," Holzer explained and added that because Pop Art is so young, she did not want to over-face him. "Normally the freestyle is pretty difficult and he was worried in the beginning. I took him off the pattern and then he was normal and he really settled in. He’s a fabulous horse to ride. I’m very lucky to have him. He’s just Mr. Dependable. He’s never bad. He was just looking at the crowd. He’s never seen anything like this, so to get him to turn around today and do what he did, I’m thrilled." Courtney King, 28, of New Milford, Connecticut, riding Idocus owned by Christine McCarthy earned 70.00% in tonight’s freestyle competition to place third, and combined with her winning Grand Prix score last night of 68.854%, she finished in second place overall with a combined score of 69.427%. King takes home $7,500 in prize money. King rode to a medley of show tunes, a track originally created for one of Lendon Gray’s Grand Prix horses in the 1970s. King admitted that she was not pleased with her freestyle tonight. "He just felt like he was a little bit more tired than yesterday and had a couple of mistakes," King explained. "It just wasn’t the best ride I could have." King noted that she is in the midst of creating a new freestyle for the seasoned 16-year-old Dutch stallion. "This freestyle was not made for him and I really feel like with all the work that I tried to put into making it work, it’s still just doesn’t work." But overall, King was positive about capturing second place in the highly competitive invitational championship. "It feels great. I think tomorrow I’ll be much happier," King smiled. "Like any athlete you always think about what you could have done better and that’s a little bit how I came away tonight, just thinking about how I could have made it better." King noted that she was very pleased to have competed against the caliber of riders in the event, and described the two-night indoor contest, which is held in conjunction with hunter/jumper, Western, and sidesaddle competition, by saying, "It’s fantastic, totally fantastic!" Suzanne Dansby-Phelps of Atlanta, Georgia, with her own Cooper earned a score of 70.94% for their wonderful freestyle to Irish music and placed second tonight. Combined with their third place finish of 66.250% in the Grand Prix, this duo finished third overall with a score 68.595%. Dansby-Phelps earned $5,000 from the purse. "In both rides Cooper schooled very, very well," Dansby-Phelps said. "He was very through and light, he exhibited all the qualities one could ask for in a dressage horse." Cooper is an 18.3-hand, 14-year-old Holsteiner gelding by Corialle by Cor de la Bryere out of a dam by Wanderin II by Ladykiller that Dansby-Phelps has been riding for four years. The crowd was very appreciative of Dansby-Phelp’s freestyle, and burst into applause during her ride several times, including her well-executed double pirouettes and her exuberant one-tempis. Her soundtrack and choreography were created by Terry Ciotti Gallo and included "Scotland the Brave" and other music from the choreographers of the Irish theater show Riverdance. Dansby-Phelps has been performing this kur for three years and tonight was the last night she will ride it as she is currently composing a new freestyle track and choreography. Dansby-Phelps was an alternate for the U.S. 2006 World Equestrian Games Dressage Team and trained this summer with U.S. Dressage Coach Klaus Balkenhol. She also trains several times a year with Conrad Schumacher in the U.S. and Germany. She hopes to qualify to compete in the 2007 World Cup Final in Las Vegas in April. George Williams of Delaware, Ohio, aboard Marnix owned by Chuck and Joann Smith scored 68.50% for their freestyle to a medley of Cher classics to place fourth tonight and added to their fourth place score of 64.063% last night in the Grand Prix, the duo finished fourth overall with a score of 66.282%. Williams earned $2,500 for his performances. The dance tunes were crowd pleasers, and Williams liked his ride as well. "I was really happy with it," Williams said. "It was wonderful to be invited. One of the reasons I wanted to come is just to expose Marnix to this indoor environment. He’s little bit of a high-strung, tense horse and I just try to expose him to as many things as possible to help him mature. I was really pleased with how he handled tonight." Williams trains Laura Noyes and Syncro, the Young Rider who will represent the U.S. at the FEI Young Rider World Cup in Frankfurt, Germany, in December, and noted his gratitude to the Washington show for allowing her to ride her freestyle in exhibition last night. "It’s perfect exposure for her and her horse, this indoor stadium environment. You can’t duplicate that experience without actually being in a stadium," he pointed out. He also noted what a benefit it is to the Grand Prix riders in order to prepare for indoor competition at the winter European shows. Overall, Williams was pleased with the entire experience of the WIHS Invitational Dressage Championship. "It’s been wonderful. I really enjoyed it," Williams enthused. They have made the dressage riders feel extremely welcome." Officiating on both nights were two international judges. 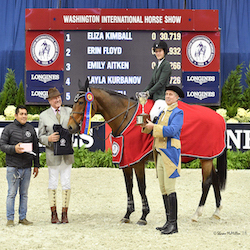 Tonight, USA judge Gary Rockwell of Wellington, Florida, officiated at C and Peru’s Marian Cunningham of Middleburg, Virginia, judged from E.
Judge Cunningham summed up the $25,000 Washington International Horse Show Invitational Dressage Championship, saying, "It’s great. I’m glad that they’re doing it." Judge Rockwell gave his overall impression of the 2006 WIHS Invitational Dressage Champion Ashley Holzer and Pop Art, pointing out first that it was the youngster’s inaugural Grand Prix. "From here she’s going to build because first year Grand Prix is always rough around the edges," Rockwell said. "It’s a spectacular horse!" Photo Caption: Ashley Holzer and Pop Art Win $25,000 WIHS Invitational Dressage Championship Photo Credit: Diana De Rosa. This photo may only be used in relation to this PMG press release.